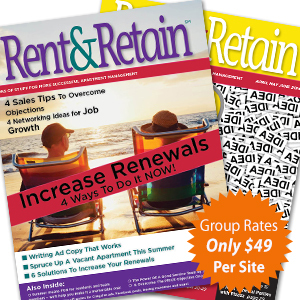 Save with our popular Group Rate subscription. 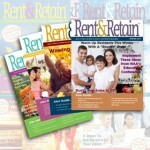 Now only $49 per site. 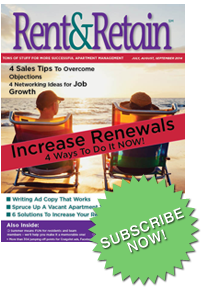 Rent & Retain Magazine is a jump-start collection of ideas designed specifically FOR the onsite manager and leasing team to help them lease apartments right now. 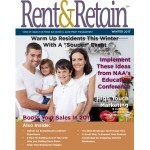 Filled with fresh marketing and retention ideas, it’s a super supplemental tool to help you inspire your team members. 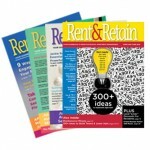 The strategies are fast, easy, and inexpensive to implement. 1) Need to be invoiced? No problem! Just let us know. 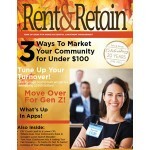 Please email a list of your sites with their names/addresses/phone/emails to Katie@RentandRetain.com. We’ll take care of sending subscriptions to each property and send you an invoice. Thank you!